Indonesian food. 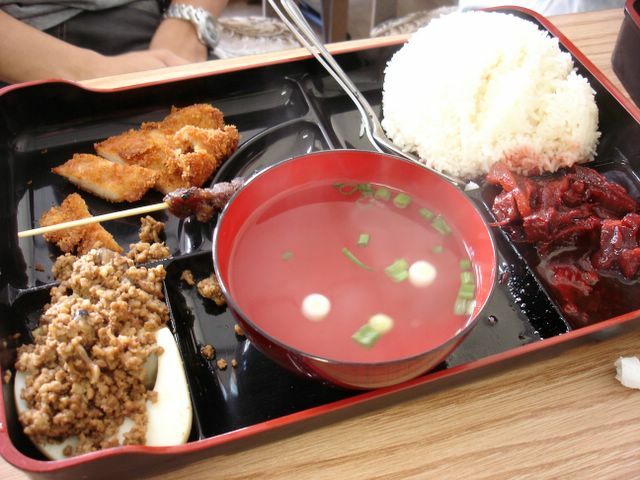 Of all the Asian cuisines, it's even lower in popularity and acceptance in the U.S. than Filipino food. If Filipino cuisine was the UPN Network, Indonesian cuisine would be PAX TV. Indonesian food, for those uninitiated to it, could be best described as a heartier version of Thai food. The base flavors like lemongrass and coconut milk which inhibit Thai cuisine are also present in Indonesian food, but Indonesian cooks employ other, somewhat more exotic ingredients, like the indigenous "kecap manis", a thick, gooey soy sauce sweetened with palm sugar. And spices like coriander, cumin, and galangal aren't in short supply in the food either; a testament to Indonesia's history in the spice trade. In terms of preparation, Indonesians favor more stews than stir fries, and more rice in their soups than noodles. I like to call Indonesian "the soul food of South East Asia." It's a stick-to-your ribs kind of cuisine. 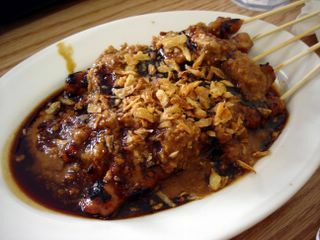 Take for example the well-known dish, sate (sa-tay), sticks of grilled meats eaten with peanut sauce. This specialty, which originated from Indonesia, is a common appetizer in Thai restaurants. 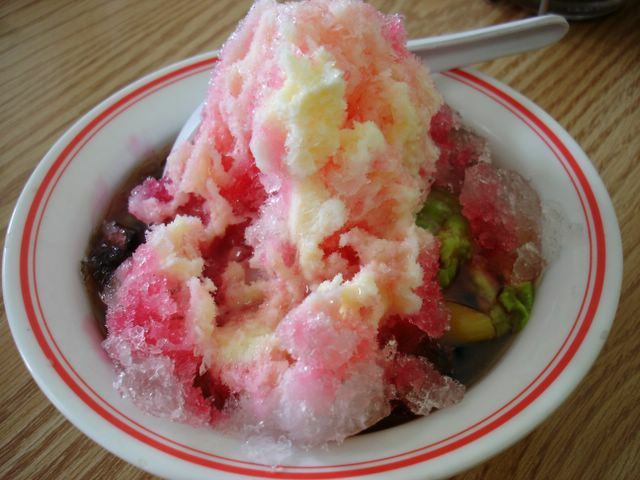 The Indonesian original, by contrast, is usually so bold and rich that it must be eaten with rice. Sometimes, it is served along side a murky goat curry called "gule" (pronounced "guh-lay"). 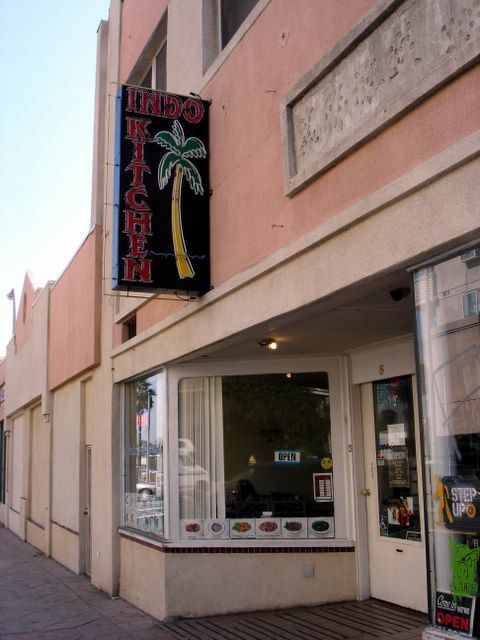 So why is Indonesian food a mere footnote in the Southern Californian restaurant scene? The answer, I think, is simple. There are few Indonesians immigrants around. The diaspora is dispersed and few, so it should come as no surprise that Indonesian restaurants are found in obscure places, like dandelions carried by the breeze. With the recent exception of a cluster of restaurants that popped up in and around the Hong Kong Market in West Covina, the older, more established Indonesian joints are flung between Bellflower (Toko Rame ), Los Angeles (Indo Cafe), Westwood (Ramayani) and Diamond Bar (Asian Deli). There are a few more I can count just by using the remaining fingers on my hand. One of those is Indo Kitchen in Alhambra, which I recently tried for the first time. In a quiet corner of the city's downtown, the Indo Kitchen storefront is wedged inside an old, weathered building. Color snapshots of their food are taped on the windows facing out to the street, in the hopes of enticing the occasional clueless pedestrian. But once I entered the cramped, yet cozy dining room, it was obvious that only Indonesian ex-pats and the occasional Dutch patronized this place. Of the few faces in the restaurant that day, none seemed to be there by chance. No one had walked in from the street just out of curiousity. We were enticed by the recent review Jonathan Gold did on the place (which was proudly framed on the wall). We sat and ordered a few items to sample. Shortly thereafter, our desserts came out. I had forgotten that Indonesians regard the dessert we ordered as a drink. So it is customarily served before or with the meal. The Es Campur (which literally means "ice mix") is a heaping bowl of shaved ice drizzled with rose syrup and sweetened condensed milk. Underneath this mound hides chopped jackfruit, grass jelly, palm seed, and avocado. It was a refreshing, colorful, albeit overwhelmingly sweet start to the meal. The main course quickly followed. My order of Gado-Gado (which loosely translated meant "a dish without rice"), is a crunchy salad of boiled water spinach, bean sprouts, green beans, cabbage, and shredded lettuce. Fried tofu and hard boiled egg add some protein to the dish, while shrimp chips contribute a crunchy constrast. The one component that makes or breaks Gado-Gado is the peanut dressing, and I'm glad to report that Indo Kitchen's did not disappoint. It has a rich consistency imparted by the ground peanuts and coconut milk, while aromatic hints of lemongrass and coriander provided character. Imagine it as peanut butter kicked up to overdrive. I did wish, however, that they went a little easier on the amount they poured on the salad. The whole dish was drowned in the sauce, and the subtle flavor of the vegetables were overpowered in the deluge. The Nasi Campur that my friends ordered, despite the Indonesian name (which translates to "Combination Rice"), was *NOT* Indonesian at all. You should have seen our puzzled looks when the bento box (yes, you heard me right...bento box) was served to us, with nary any Indonesian food on it! Where was the Rendang? Where was the Perkedel? As it turns out what we should've ordered was the Nasi Rames, which had all those things I was expecting. This dish we ended up with consisted of an overly gristly and sugary cha siu (Chinese BBQ Pork), a hard boiled egg under an avalanche of soy-cooked ground pork, fried chicken katsu, a pork sate, a bowl of clear soup, and a mound of rice. My friends did not object to the dish, but then again, they aren't Indonesian. I suspect that this meal was designed by the chef as a proxy to non-Indonesians who wandered into the restaurant by mistake. We made up for it by ordering a side of chicken sate, which was quite authentic and smothered in peanut sauce and fried shallots. Eventhough the meat of the chicken was dry, the savory-sweet and lip-smacking sauce compensated. This concoction, accented by a liberal drizzling of the syrupy "kecap manis", is great eaten with rice. Once we left the restaurant, I was full and happy. Yes, you could say, "I was sated from the saté". Pun intended. Hey Elmo - That sate looks good. Too bad you got the gringo-pseudo bento! I'm wondering how is Penang in West Covina? It caught our eye on our last trip to LA? Great review as always! Anyhow, great post! And I love the reference and imagery of the dandelions. I'm full just reading your fabulous review! Interesting, ice cream BEFORE the meal. Kind of goes along with the whole south east asia sweet tooth thing. I love the addition of fried shallots to anything. In asia all dumplings and steamed buns (dim sum style) come topped with fried shallots. How come more places here dont do that?! elmo, nice review. i've never tried indonesian food and it was interesting to hear the mother ingredients of your cultures food. i'm by alhambra, so i'll try that out sans bento box. The sate was indeed good. I did wish the meat was more tender. It was dry perhaps because of overcooking. I have tried Penang in West Covina, and I'd have to say some dishes were good while others were not. Since it is Malaysian, they used a lot more curry than Indonesian food. Their best dish is the roti canai served with a thick and murky bowl of chicken curry. I loved this dish, but I recall I did not like some others I tried...can't remember what they were to tell you to avoid them though. Thanks! Glad my review "sated" you too! That *was* kind of a calorie fest. It may have been a salad, but that peanut sauce probably had the caloric equivalent of two Butterfingers! Fried shallots are the bomb! I think I forgot to mention that they put some on my salad too. Indonesians even put fried shallots *AND* fried crispy garlic in the soup they call "soto". And oooh is it good! Hey cool, you're close! Yes...avoid the bento! try the Nasi Rames (pronounced "Nah-see Rah-mess"). Thanks for the always interesting reports. 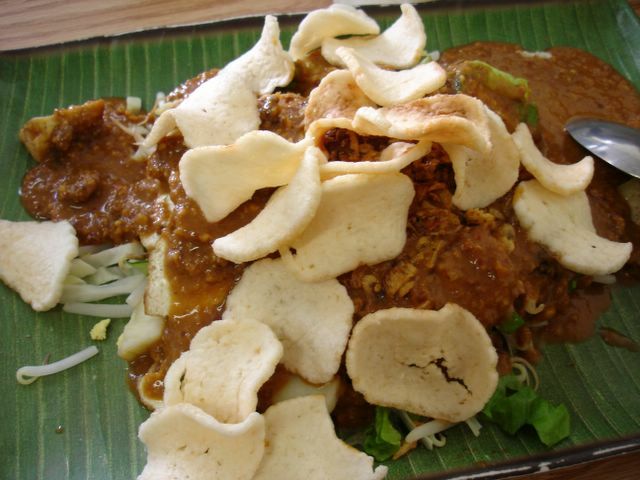 Is there one dish in your opinion that's an absolute must-try for Indonesia food virgins? First time commenting here, but I have to say that I really love Indonesian food. Too bad we only have one restaurant here and it's not very good. Maybe next time you can try the es bandung if they have it. It's a drink made with rose syrup. Very sweet, but refreshing! Looks like you were in my stomping ground this weekend and I was in yours! 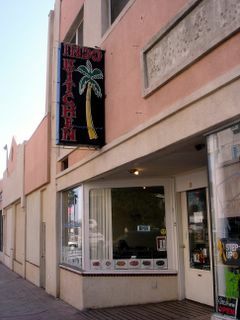 I never knew about this place...I'm in Alhambra alot so I'll be sure to try it. You're right, there aren't many Indonesian restaurants here. There is one that opened up in Downtown LA on 4th street called Warung Cafe. Haven't been there yet though. If there was one dish I'd recommend it's the Nasi Rames. This dish kind of introduces you to the cuisine. It's kind of a sampler platter. If I recall correctly, I think the Indo Kitchen menu said that it had; "rendang" - a piece of beef that's been cooked until tender in a thick sauce made with coconut milk and spices; "perkedel" - a fried potato fritter; and other items around a mound of white rice. They also do something called "Lontong Cap Go Meh", which is a traditional dish eaten at special occasions (usually New Year). Jonathan Gold describes this dish as "an estimable bowl of lontong, loose rice cakes cooked in a spicy chicken-coconut broth and served with a chile-smeared egg, pale lattices of fried shrimp cracker, and bits of taro and jackfruit simmered to a sort of battleship gray." Welcome! I've been enjoying your blog for a while now, especially your Indonesian finds in Hawaii. I haven't heard of Es Bandung, but I'll be sure to look for it. I think Es Cendol is still my favorite Indonesian drink/dessert. And Indo Kitchen does a pretty good rendition of it too. Cool! I didn't know about Warung Cafe. Kind of a funny name though, because "Warung" loosely translated, means "cafe"...I'll have to check it out the next time I'm up there! Pam - Hey cool! The article *does* mention the redundancy in the name...sounds like a great place. I hope they can do for Indonesian food what Yi Cuisine is doing for Filipino food. Will definitely put this on the things-to-try-in-LA list. I'm a regular at Indo Kitchen. I think they serve the most authentic Indonesian food (in terms of taste) compared with other Indonesian restaurants in LA area. Talking about "Nasi Campur", it's also authentic (freestyle), yet it is the combination rice version of Chinese Indonesian, mostly for Jakartanese and Medanese. It does have CHinese influence, though. "Nasi Rames Padang" is definitely yummy, but very spicy. Other dishes you should try are "Ayam Bumbu" (seasoned fried chicken), "Mie ayam" (chicken noodle). Thanks for the post. Have you tried Little Java in L.A.? Been hearing good things about this place. Hi, I just read your writing about Nasi Campur. In Jakarta, if you go to the china town area (Kota/Glodok area), you can get nasi campur which is similar to what you get (well, minus the chicken katsu). It's basically the mixture of BBQ pork (char siu), crispy pork (don;t know in Chinese), hard boiled egg cooked in soy, sometimes with Ngo Hiong roll and a bowl of soup. I think that nasi campur refers to the Indonesian Chinese style of nasi rames. "I had forgotten that Indonesians regard the dessert we ordered as a drink. So it is customarily served before or with the meal." You're right! It happened to us while we traveled to Vancouver last summer, we went to one of Indonesian restaurants there, Pondok Indonesia. They served blended avocado (jus alpukat) before the meal. My parents are both Dutch-Indonesian and they used to take us to an Indonesian restaurant every other month or so. But you are so right about the lack of popularity of Indonesian food. My wife is Filipino and she has way more options. I think most Americans can't deal with all the "stuff" that is put into Indonesian drinks and desserts. I remember going to the now closed Susie's Kitchen in Cerritos and all of us, wife included, ordering various Indonesian drinks. And every time the waiter got to my gringo brother-in-law, he would look up and say, "Yeah, I'll have a root beer."